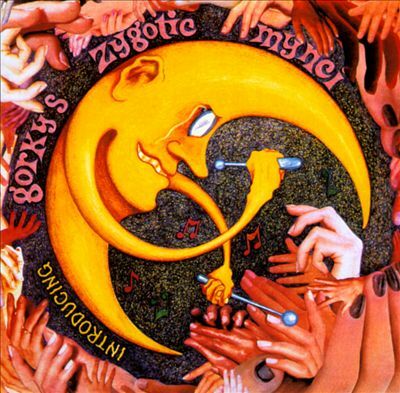 Driving to lunch last week, the in-car entertainment was provided by Gorky’s Zygotic Mynci, the fabulously named Welsh band (b: 1991, d: 2006) recently featured by Mr 1537. It was the first album; a collection of EP material that – whilst not having the polish of later releases – shows their quirky creativity and fine ear for melody in a more lo-fi setting. Strolling towards the meeting place I found myself humming the theme of Ivor the Engine. More ‘bom bom bom’-ing really, somewhere between an oboe and a bassoon, both in need of fresh reeds. 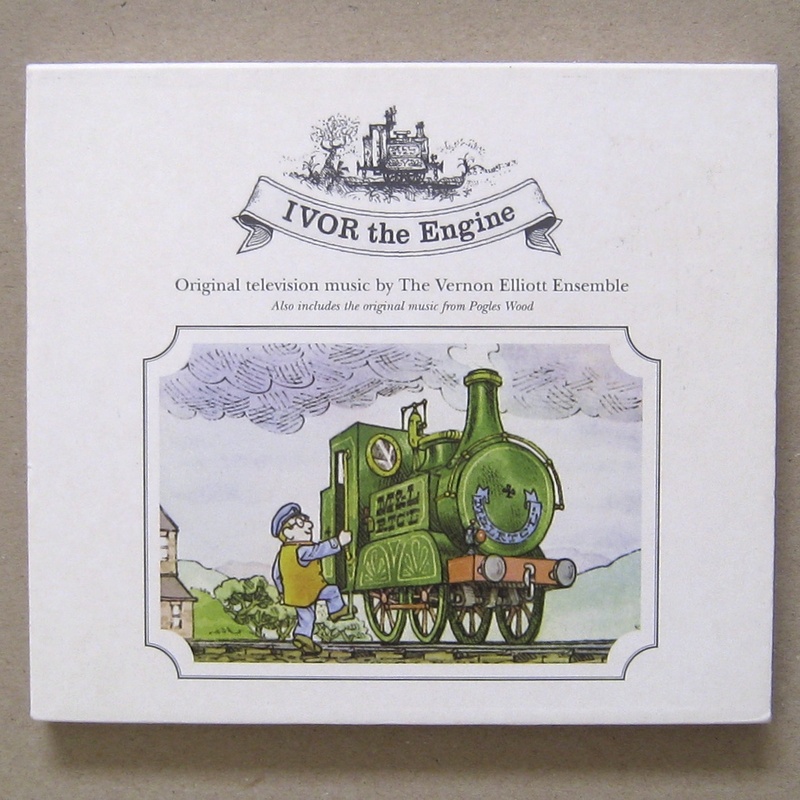 If you do not know Ivor and enjoy a peek through the time-telescope at simpler days, check it out on YouTube. To give you a flavour, the steam engine sound is a man going “Shhh-te-koof, Shhh-te-koof”. There are farms, mines and a dragon who sings in a pure alto voice. It’s easy to enjoy Ivor’s quiet charm and drowsy gentleness. Great Uncle Les, who died in mid-2001 at the age of 96, worked in the Welsh mines before migrating to Australia. He sang, as did his brothers. 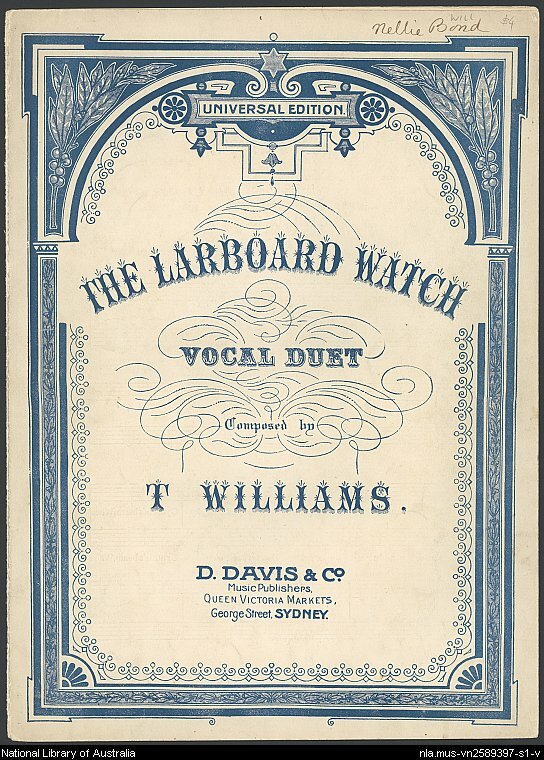 At gatherings in my grandparents home they would stand around the pianola and sing “Larboard Watch” in harmony. The last time I saw Les was after a serious health problem some three years earlier. He recovered but could not sing. When he told me I saw moisture in his eyes that was not just age and frailty. It was the only time I saw emotion in any male in my family. Then he grinned a faint, lop-sided grin. “I could have done without the stroke, Bruce”. He was a man of few words and parchment-dry humour. His father, my great grandfather Allan, once ran for office in a local constituency in Wales. I thought I had a handbill from his campaign but alas, was unable to locate it. Family history does not record the outcome so I expect that he was not successful, but I like that he acted on his values. 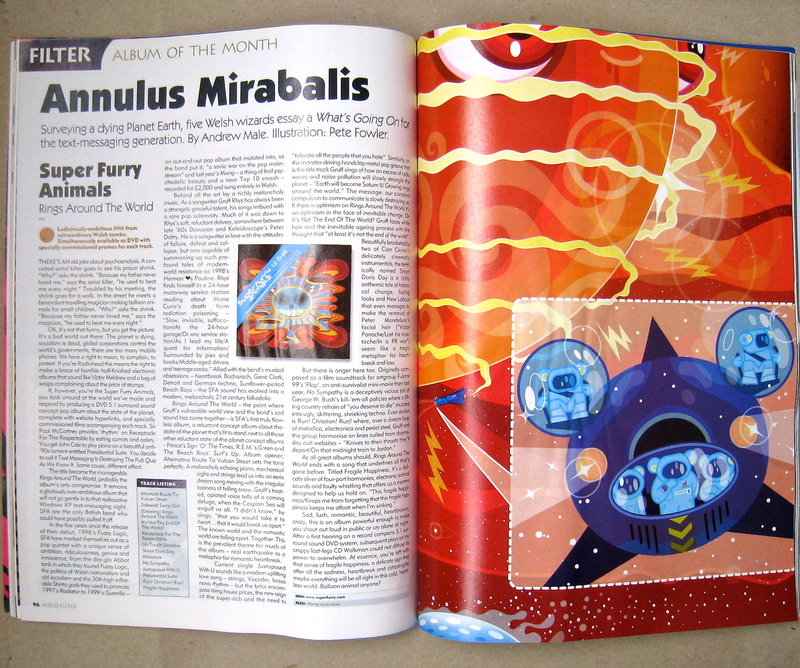 My interest was piqued by a glowing review of the new album by Super Furry Animals, released in July that year. New or old made no difference as I’d never heard of them, but it was Album of the Month and in addition was awarded the Mojo ‘Gold’ seal of approval. Has to be good, I thought. Andrew Male’s splendid review of Rings Around The World opens with an old psychotherapy yarn that bears repeating. The themes weaving in and out of the album deal with love, loss, politics and the essential entropy of life. What will we make of this hand we’re dealt? There is always a choice. With melancholy diffidence the voice of Gruff Rhys traverses topics that range from the challenges of millennial love (‘Juxtaposed With U’) through to Bush-era US policy (‘No Sympathy’) via pollution by mobile phones (the title track). Yet we are never hectored or lectured and for all the elegant disintegration there is a quiet hope that pervades many of these songs. History quickly challenged this, of course, with the already unsettling cinematic dream-pop of ‘Run Christian Run’ taking on a chilling resonance after 11 September. Somehow Rings Around the World belongs to that year: post-millennium hangover, jittery uncertainty everywhere, the insistent tug of despair. Sonically the album is lush, strange, hauntingly familiar and joltingly modern. But don’t get the idea that it’s all keening whimsy. 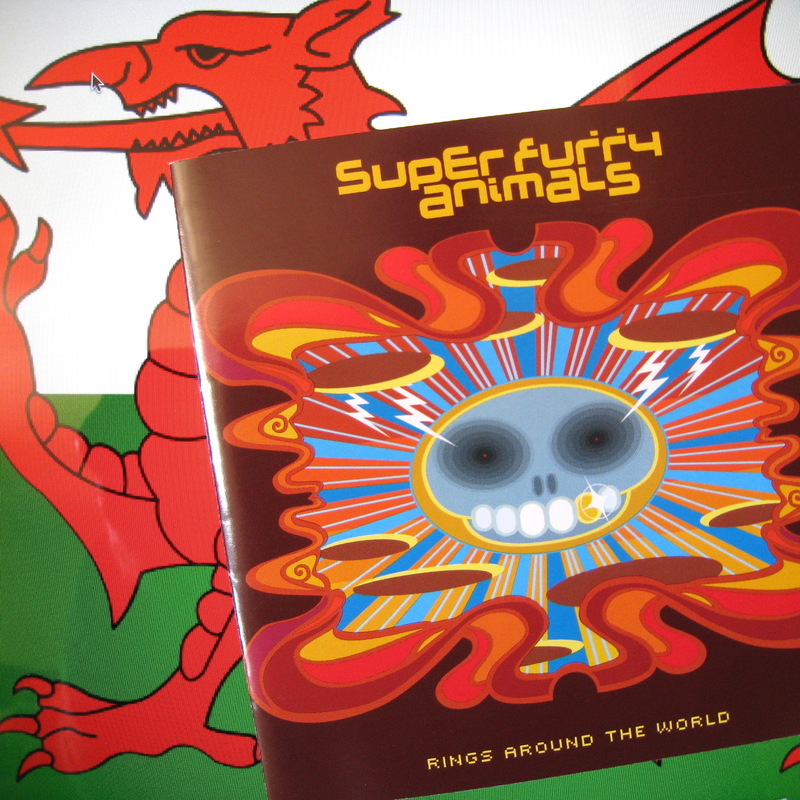 Super Furry Animals love to thrash and startle too. They know their music history and want you to ride the soundwaves with them. My partner’s father had been fading for a long time. His wife, dedicated to sitting by him on this last journey, was tired. Heeding the encouragement of family to take a long-planned trip to Australia, she arrived with us in November 2001. It was while she was on a day-trip to Phillip Island to see the penguin parade that we received the call that her husband had died. When I went to visit my father in hospital to tell him that we were going to the UK for the funeral, I joked, ‘No copy-cat dying while I’m away’. He died three days after we returned, a few hours after his 83rd birthday. I remember playing Rings Around The World. ‘It’s not the end of the world?’ reached out. ‘Shoot Doris Day’ was my favourite. Not that I was burdened with grief. Yes, it was sad but he had been cleaning leaves out of the guttering six months earlier and my relationship with this difficult man was better in the last couple of years of his life than at any other time. Somehow Rings Around The World belongs to that year; shared loss, companionship, change. I met my friend for lunch. We both chose the chicken and leek pie. There have been ups and downs over thirty years of friendship yet I was struck by how easy it seemed to ease past old differences, loosen old rigidities. “What have you been listening to?” he asked just before we parted. Mistake. Standing on the curb of busy Nicholson Street I spurted my enthusiasm for Rings Around the World for longer than your average 7”single spins. If you are interested in Super Furry Animals and more attuned to Ziggy Stardust than Radiohead, I suggest starting with the album after Rings Around the World. It is called Phantom Power and is a stomping, glam-infused ripper of an album. If it captures you, working backwards or forwards from there will deliver further delights. You be movin’ in on my turf? Great post. There’s always been pretty strong Aus/Wales connections. I suspect my nation provided a high percentage of forced émigrés back in the day. I’ve got a couple of great Welsh compilations from the early 90s. My fave being Dial M For Merthyr! Gotta love SFA too, especially their early singles. More fertilising than encroaching upon your hallowed ground, I hope. That Dial M comp sound marvellous. There was also ‘I Was a Teenage Gwent Boy’, that was a damn good one too. I know “I was a teenage creature” of course, but perhaps now you’re puling my leg. I loved this post, Bruce, and I enjoyed hearing about your Welsh family background. “How Green Was My Valley” (about Welsh miners – have you ever seen it?) was my dad’s favorite film. He had it on a VHS tape and we must have watched it together at least 20 times over the years, no joke. I absolutely loved listening to “Larboard Watch”! We also sang in harmony around the piano. I think that’s one reason dad liked “How Green…” so much, because they sang “O Guide Me Now, Thou Great Jehovah” – that was one of our songs. He died in 2006 and I still miss him so very much. He was a kind and gentle man, full of fun, laughter, and music. I hope to visit Wales one day – in part to honor his memory, but also because I know it is absolutely beautiful. I still like to sing – tonight I sang all ten thousand verses of Greensleeves, several times, with hubby on guitar accompaniment. A great Friday evening, to me. And to him, thankfully. I think you are lucky to live in Australia. The main thing we watch on TV are nature/geographic documentaries, and the ones about Australia are our favorite. What a rich and fascinating land! I hope to visit there too one day. Melbourne looks really cool and interesting in the AC/DC videos, haha! Do those guys still live there, by the way? I don’t know much about modern music from the post-grunge era to present, with a few exceptions, but I’m going to check this album out – sounds good! I’m sorry for the long post – I guess I got carried away. Your post inspired me. Now I’m going to go listen to “Larboard Watch” again. Thanks for the great post! Correction 2: “Guide Me, O Thou Great Jehovah”. I knew it wasn’t quite the right title and had to look that one up – it’s been a long, long time. Thanks for sharing your thoughts and connections, Marie. Communal singing seems to have gone the way of 78 RPM discs, except for church singing. The only thing I am envious of in that arena! I guess we could arrange a group Skype, but it wouldn’t have quite the same feel, would it. I wonder what it was that your Dad connected with in ‘How Green Was My Valley’. I also enjoyed the sense of place and changing places that is in your reply/comment. Environment is a powerful thing and every human community has its unique culture and its own flavour. Finally, if you ever decide to change that title of your blog – and there’s no reason to – it’s beaut – but as I say, if you DID decide to change, I reckon “My Heart is still in the Swamp” would be hard to beat. Sad that communal singing and storytelling have fallen to the wayside, and strange that they should have disappeared so completely with the advent of TV and so forth. Ah well, but we must look at the benefits we enjoy in our modern world – instant communication around the world like we are doing is truly incredible. Also, I normally try to refrain from getting too political here in blog-land, but I just have to say – I am absolutely shocked, horrified, and heartbroken about the senseless, brutal murder of Christopher Lane in Oklahoma. I understand that he was a native of Melbourne. Something simply must be done about gun control in this country. We are not in the wild frontier anymore, and there are too many violent, scary people out there now to have such widespread, unchecked availability of guns. It’s an embarrassment to the entire nation. Once again, “Golden country, your face is so red”. Thank you for speaking, Marie. Although, from the outside, it is difficult to see a path to gun control in the US, it is certainly true that voices clearly saying, ‘This is awful. This is not OK’ are vital. There was a reaction of fear and confusion I noticed in the media in Australia, so I welcome your voice expressing hurt and shame. It’s not easy but it is important. Agreed. It is a complex problem, and there’s not a simple solution – but it’s vitally important that we try as hard as we can to fix it. All these random acts of violence are very scary and confusing, and it seems to just be getting worse and worse. Amazingly insightful post! I love the personal/family history unearthed by these albums. Thanks for the literal laugh-out-loud with: “What have you been listening to?” he asked just before we parted. Mistake. Our posts and writing are about enthusiasm, aren’t they. And just sometimes there can be a bit more enthusiasm than friends or partners really want. I’m finding that my groove seems to be about teasing out the personal stories that interweave with the music, so I really appreciate your comment. Thanks. Wonderful piece Bruce, thank you for sharing.